From the age of ten Martyn Joseph’s aim in life was to be a professional golfer. Although he had some talent, by the time he reached twenty two he realized it wasn’t going to happen. As luck would have it he also started playing the guitar around the same time the golf ambition hit. By the time his original career goal had crashed and burnt he was already performing on a consistent basis. His father financed a recording back in 1982 and, here we are 33 CDs later at the Studio / Stage Door in Cranbrook for probably one of the most brilliant singer / song writer performances seen on that stage. 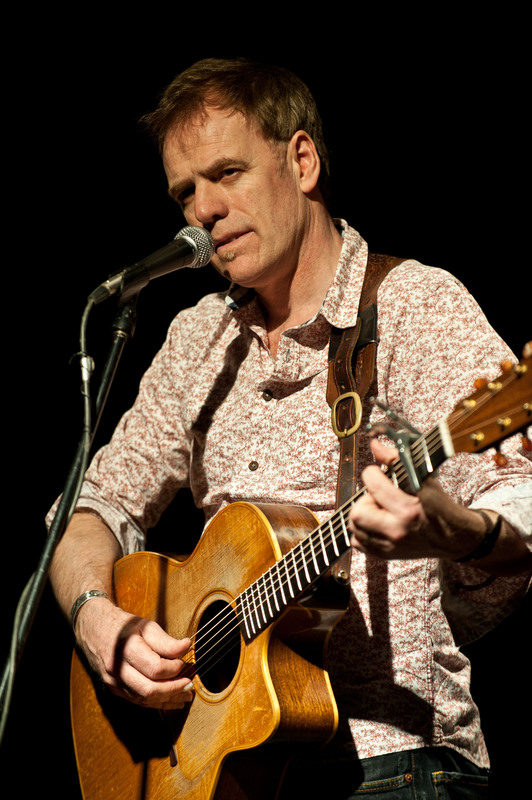 Martyn Joseph is a Welshman whose home base is, naturally, in Wales. It would seem an unlikely place for a career musician to choose as his centre of operations. But, as he explained, he tours extensively in the UK and with the huge population centers of Britain literally on his door step he can tour extensively, not risk saturating his audience and often “be home for supper”. With huge touring distances and relatively smaller population centers Canadian musicians are not that lucky. Despite some times being portrayed as a folk singer he has more in common with Bruce Cockburn and Bruce Springsteen than with Woody Guthrie and Pete Seeger. Although he has had a brush with the glitter of the popular music world with a major label recording contract (short lived) and opening for the likes of Celine Dion, his songs about “dead miners” and the human condition are more than a step away from the “moon, spoon and self centered angst” of modern of pop culture. Included in the night’s performance were many of his original songs including “Always Will be”, ”Cardiff Bay” (a homage to his home town), “The Good in Me is Dead” (a refugee song complete with a great moving bass line), “So many Lies” and “Lonely Like an American”. The outstanding original song of the evening was “Vegas” based on a chance encounter with an eighty year old cab driver in Las Vegas. The song started with a soliloquy of the encounter, then the actual song that morphed into a homage to Elvis Presley, complete with all the vocal attributes and stage mannerisms of Elvis himself. The only cover song of the evening was Bruce Springsteen’s “One Step Up”. This song was more than a mere recap of the song. It was literally a deconstruction of the genius that went into the Springsteen anthem. By the time it was over the audience knew how the song was put together and how the melody, words and chord functioned in this masterpiece of pop culture. All through the night’s performance Martyn Joseph’s guitar skills were more than evident. In his hands his Lowden and Santa Cruz guitars sprang to life with lots of melody, bass runs, rhythm, punch, drive and percussive punctuations. 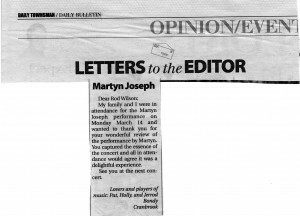 Once again the local impresario Gordon Johnston has come up with an “unknown” artist who has managed to deliver a performance that was nothing short of brilliant. The production team of Terry Miller, Gordon Johnston, John Siega (sound) and Kris Aasen (lights), along with one failed Welsh golfer, two guitars and a bucketful of songs has proven to be a winning combination. 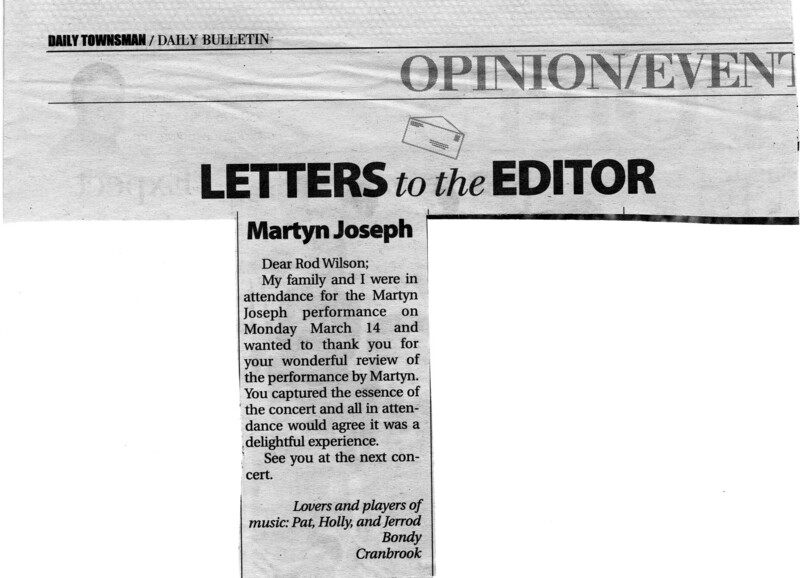 Kudos: Monday March 20, 2011, Daily Townsman ………………………………………………………………….